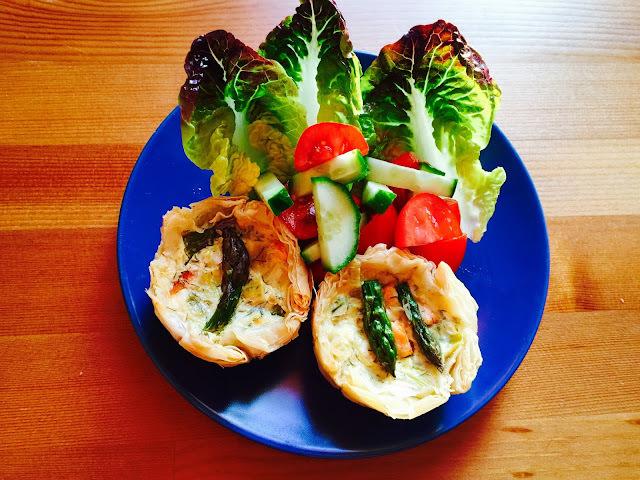 I made these smoked salmon, feta and asparagus fillo tartlets a while ago already prior to my parents visit about a month ago. We had some of them then after coming home from the VE day concert at Royal Albert Hall. I’ve been trying to do some freezer emptying this week so defrosted a couple for husband as a late evening snack last night. Tarts and quiches used to be pretty much the only thing I could cook for a long time before I started to get interested in cooking only a few years ago. Whenever I had people over it would probably be a tart of some sort. It wasn’t much of a dinner party central at mine those days, more of a let's get rocked kind of a place with heavy metal music and lots of vodka. Those WERE the days. I remember one "Let's do something civilized for a change" evening with a friend. We decided to do a wine tasting which predictably turned out a bit like Patsy and Eddie in France. After some goat cheese tart, we were both carefully and elegantly zipping the wines and making notes in our little notebooks referring back to our wine guides. A few hours later the note books and guides had been abandoned, Black Sabbath was blasting and we were falling off our chairs all but swigging the wine straight from the bottles. I remember another night with the same lady. It was just before Christmas and we were at her place with her newly found boyfriend who ended up being the father of her 3 children eventually. Instead of gluewein she had bought something called gluecognac. Exactly! It didn't bode well. If I remember correctly, which is unlikely, the evening ended with her blaming her boyfriend of trying to murder her and me somehow managing to get a cab home after she passed out on the kitchen floor with murderous boyfriend already gone to bed. Fun times, but stay away from gluecognac. Things have mellowed down a bit and liver is ever so thankful for that. 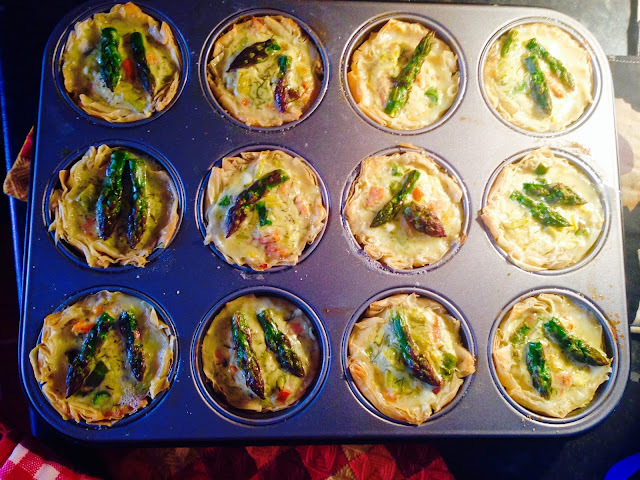 My love for all kinds of quiches and tarts remains unchanged. They’re great to have in the freezer for a surprise visit or other kind of tart related emergency. This is a very flexible recipe, tarts often are :) so don’t worry if you don’t have all the ingredients. 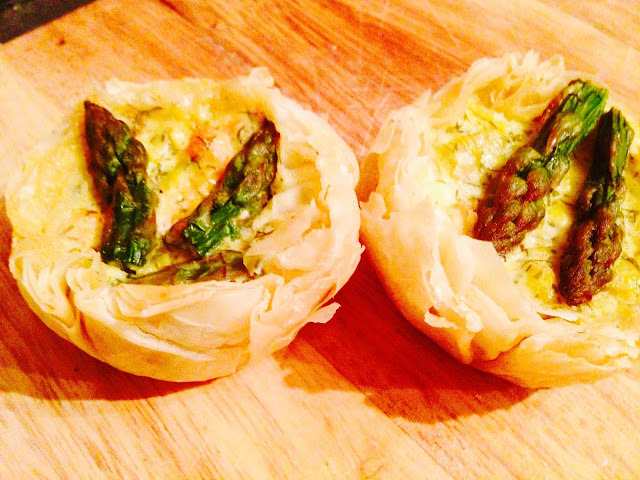 Just make a nice tasting filling, fill the fillo cases with it, bake and eat with a modest amount of crisp white wine. Start by preparing the filling. Chop the leak and dill. 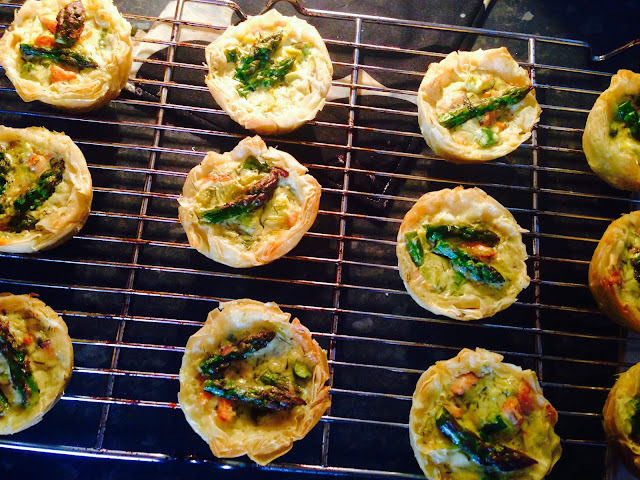 Cut the pretty tips of the asparagus spears and keep them to decorate the tartlets and chop the rest roughly. Heat a tbsp of oil in a frying pan. Fry the leak for some minutes on low to medium heat until it softens. Add the asparagus, dill, zest and juice of half a lemon and 1/4 cup of white wine. Cook until liquid has evaporated. Roughly chop the smoked salmon and flake the hot smoked or poached salmon. You can also use left over pan-fried or baked salmon in this. Add the salmon to the leak mixture. Add the cubed feta. Mix sour cream, milk and egg together and add to the filling. Season with salt, and lemon pepper. Check taste and add seasoning or a dash of lemon juice if necessary. 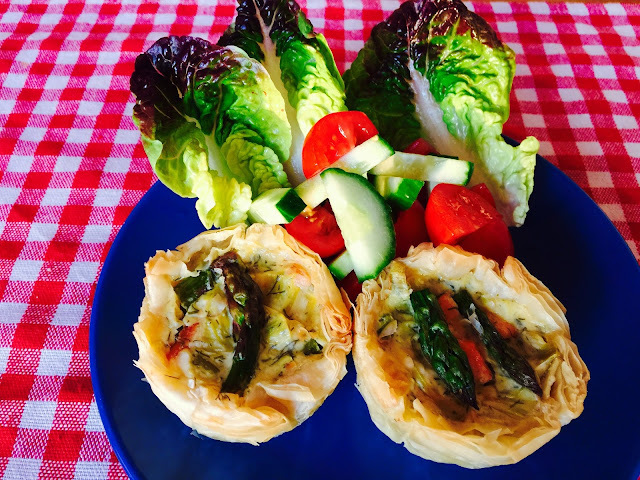 You can of course just do one big tart in a round tart dish, but this time I wanted individual small ones and decided to make them in my muffin tray. Melt the butter. Place one sheet of fillo on clean surface, brush with butter. You can sprinkle with breadcrumbs, but this step is optional, it maybe adds a bit of crunch and keeps the pastry cases flaky and airy. Place another fillo sheet on top, brush with butter and sprinkle with breadcrumbs. Add one more layer like this and finish by placing the 4th fillo sheet to cover. Lightly grease you muffin tray. Cut the fillo into circles that are big enough to cover the bottom and sides or a muffin mould using a big round cutter. Or you can cut to squares and then just trim the overhanging edges. You may need to repeat the whole process with more fillo sheets to make more pastry cases depending on the size of your sheets. Fill each pastry case with filling all the way to the top, but not covering the edges of the pastry. The filling is not going to expand so it won’t overflow. Decorate each tartlet with one of two asparagus tips. Bake in 200 C oven for about 15 minutes or until the pastry has turned golden and the filling has firmed up.